This is the first known—to date—volume dedicated entirely to mixed drinks in the English language. 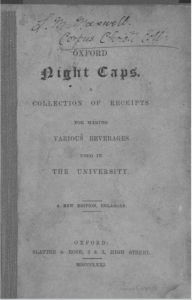 Oxford Night Caps: A Collection of Receipts for Making Various Beverages Used in the University was published a number of times between 1827 and 1931 to aid Oxford University students in mixing proper beverages for their on- and off-campus gatherings. 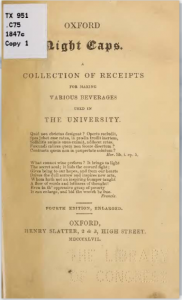 The soft cover format remained the same from edition to edition and so did the drinks for the most part. In this 1847 edition, ice was usually not part of the formula. Dilution relied on room temperature water. (Remember that room temperature in England is much lower than in other climes.) So ice didn’t enter the picture until the turn of the century. Rumfustion and a few dozen punches are worth revisiting today. So are the lower alcohol cups. 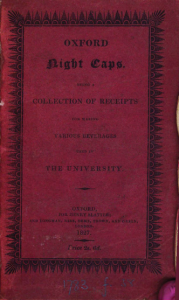 Click here to view the 1835 edition. Click here to view the 1827 edition. 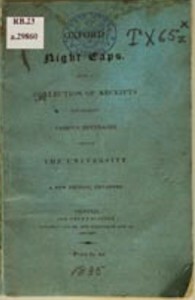 Click here to view the 1871 edition. Thanks Gaurav for recommending such a beautiful knowledge sharing link.